Last night I finally found the time to open an account with DollarSavingsDirect. For those that are familiar with it, DollarSavingsDirect is a new(ish) high yield savings bank. Amazingly, despite month of falling rates, they managed to stay atop my list of online savings account interest rates with a juicy 4.00% APY. 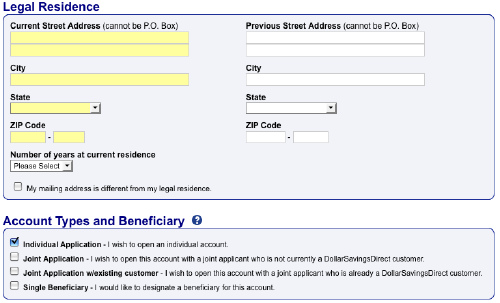 While DollarSavingsDirect is a relative newcomer to the online banking game, it has an older sister named Emigrant Direct. 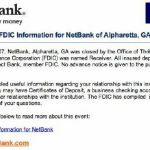 In fact, both banks are owned by the same company (Emigrant Bank), and even share an FDIC certificate (and thus they have a common FDIC insurance limit). In fact, aside from the name, it’s hard to tell them apart — they have the exact same online interface. Oh, and then there’s the small matter of their rates… As noted above, DollarSavingsDirect pays 4.00% APY, whereas Emigrant Direct is languishing back at 2.50% APY. While I’m not sure of their motivations, it appears that Emigrant Bank wanted to attract new money without paying their existing customers a premium. Whatever their motivation, the current rate at DollarSavingsDirect is high enough to get my attention. While I doubt it’s sustainable, I’ll take it while I can get it. Step 1: Select your login credentials. 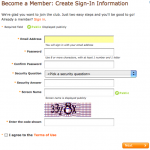 The application process starts by asking you to choose a username and password. 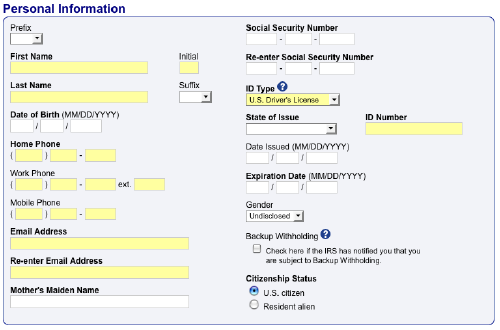 The next step is to enter your personal information, including your social security number and driver’s license info (this is standard fare for banks). Step 3: Enter your address and choose an account type. Next up… Your address. They actually need both your current address (along with your time at the current residence) as well as your previous address. I’m guessing that this is part of their identity verification process, as they can check both addresses against your credit record. If you choose a joint account, you’ll be asked to enter all of the same information for your joint account holder. The final step is to fund your account. As usual, I chose to link the new account to our local checking account. Note that DollarSavingsDirect requires a minimum deposit, so it’s not quite as forgiving as some of its online banking brethren. We went with the minimum for now, and will move more money once everything is up and running. And that, my friends, is it. As things stand, we’re awaiting final approval — apparently, it’s not fully automated, and I applied in the middle of the night. I will update with more details and screenshots once they provide us with full access. Still makes me miss the 6%+ days. I opened one up earlier this week. You can only link 2 external checking accounts. 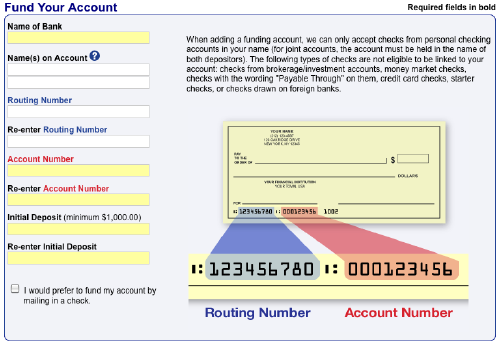 In order to link the 2nd account you must fill out and mail in an authorization form with a voided check. Simply entering your routing and account number like you do for the linked account you used for your initial deposit will not suffice. Also, didn’t take too long for the rate to drop to 3.5%. Maybe they’ve fixed those problems since then, but basically I just moved all my money back out and have just been too lazy to take back the $30 or so that’s left. I haven’t logged into the account for years. I already have an account at HSBC and my checking account at my credit union pays 4.04% (if you meet some pretty simple requirements). I’d like to move some of my money from checking to a savings acct, but it’s my highest-interest account. So DSD would be beneficial, and it would keep me from spending money while still earning as much interest. My concern is that if I open one with DSD, how long will it be before their interest rate coasts down to match all the others? I can confirm it is 3.5% now. The CD is down to 3.25%. I just opened the savings account about 2 – 3 weeks ago. It’s still better than ING (just dropped to 2.4%) but drifting away from my 5.01% rewards checking with Provident Bank of NJ. I want to maximize yield on my savings so I was thinking about moving it all into the checking account (yield only good up to $25,000, then 1.25% or something like that) but I’m worried I won’t be able to segregate between what is “savings” in my checking account (i.e. emergency funds vs funds available for purchasing toys and such). Any advice you can offer other than trying to keep track of it on paper separately? At what point would you jump from one online savings bank to another? I have an account with GMAC which is currently earning 3%. I could probably earn $100 more a year if I move the funds to DSD, is something like that worth the effort? RainOnMyParade: Based on what? Their site is still showing 4.00% APY. It’s the CD rate that has dipped to 3.50% APY. Savings rate dropped to 3.50% today – Jan 23. I’ve had a DSD account for about three months – I’m kicking myself for not opening it sooner! If your experience is like mine, you can expect an email where they ask you to call in to complete verification of your account, and when I did that, they asked me to fax or email a copy of my driver’s license. Very easy, the staff I talked to was very nice. Then it will do two test transactions on whatever account you link it to (a small withdrawal and a small deposit) that you have to verify the amounts of. The interest rate is so fantastic – I can’t believe how long I’d been missing out. They also haven’t cut it when others have cut theirs recently. One note – Mint.com currently doesn’t work with DSD (it has been posted on their forums and they always say they’ll fix it, but it has been a slow process), but Yodlee.com does sync up with it just fine. Although I like the Mint interface, Yodlee has a lot more flexibility for adding cash transactions/petty cash money, etc.